Nothing like a good fire and brimstone scripture to start our Advent season. You’re welcome! Perhaps you were hoping for sweet baby Jesus or holy Mother Mary? I mean, that’s reasonable. Advent is, after all, a period of waiting to celebrate and remember the first Christmas – the holiday that marks Jesus being born among us as a tiny baby in a rustic manger in a little town called Bethlehem. Sometimes we think of the whole scene as being quite precious. But Advent is also about waiting for the coming of the fullness of the kingdom that Jesus got going when he was alive here on earth. That was a long time ago that Jesus was here in the flesh. But when we think about our place in God’s story, we are waiting. We are waiting and preparing for Christ to come again. We are waiting expectantly for that day when Christ is fully present among us and the peace and love of Christ reign in our world and in all the universe. In the words of the Catholic liturgy of my childhood: we wait in joyful hope. That sounds good, right? Joyful hope. So what’s the deal with all this fire and sulfur in the scripture? Well, before the full coming of the kingdom of God, there is always some kind of judgment. Something has to change, something has to be rooted out of the system – so that violence and oppression and hate and suffering will cease. So these kind of texts help us to imagine what is being judged. What is being rooted out? What needs to be destroyed so that we can experience the fullness of the kingdom of God? Now, I admit that judgment can be a bit terrifying. But I always go back to theologian John Cobb’s invitation for us to welcome judgment because God judges that in us which seeks to destroy us. God only wants to remove the things from our lives that keep us from living fully in the loving presence of God. That’s it. God is love. So God’s judgment is on anything that is counter to allowing that love to flow freely in our lives and in the world. And our text today gives us a particularly interesting perspective on what exactly is being judged so that we can live in the freedom of God’s love. What drew me to this scripture was the strange move it makes regarding the Noah and Lot stories. We all know the Noah story, right? The one with the ark and all the animals and how God had to flood the whole world. That was unfortunate. If we look at the Noah scripture in Genesis 6:5, it says that God caused the flood because of this: “The Lord saw that the wickedness of humankind was great in the earth, and that every inclination of the thoughts of their hearts was only evil continually.” That’s pretty bad. So, in Luke’s version, all these people get destroyed in the Noah story and the Lot story, but there’s no mention of wickedness or depravity here. No lawlessness, no willful disobedience. So it makes me wonder: what is being condemned then? Did you hear it? Eating and drinking, marrying and being given in marriage, buying and selling, planting and building. The stuff of everyday life. Perhaps we could add the stuff of our everyday lives? Eating and drinking, working and shopping, texting and planning, managing the details of our work and family day-in and day-out, trying to control it all. Our scripture ends: “Those who try to make their life secure will lose it, but those who lose their life will keep it.” All of these activities, they are not evil. But they can be the things that distract us from the part we are supposed to be playing in God’s story. We might even be so busy with our day-in, day-out routines that we don’t notice that God is present and calling us to something more, something beyond and outside of ourselves. Maybe something you yourself might not have even chosen. Now, Matt and I are vegetarians, and we had raised Ruby as a vegetarian for her whole life. And let’s just say that a 4-year-old’s ethics around vegetarianism are a little more black-and-white than ours, and Ruby was going through a bit of a judge-y period about this topic. So I did what any self-respecting parent would do – I lied. Actually, I didn’t lie on purpose – I was just thinking about cows, which I really don’t think they do eat. So, I said, “No, they don’t eat the animals that people donate.” Then we sat down and started looking at the catalog, and on the first page was a cow, and Ruby asked me, “Are they gonna eat that cow?” I said, “No, Ruby, they won’t eat that cow. It says right here that they keep the cow and use it for milk and for manure to fertilize the soil and heat their homes.” And Ruby was pleased. And I had to admit that, yes they are going to eat those bunnies…or at least some of their offspring. Well, this led to some good conversations about meat being a good source of protein for people who couldn’t buy veggie burgers at the store, which Ruby did not really appreciate at age 4, but of course understands now. But our family has never given money to Heifer International. In fact, it wasn’t Ruby’s but my own purist vegetarian inclinations that were my excuse for not supporting this organization that does amazing work around the world. They give animals because animals reproduce and therefore the people who receive them can become self-sustaining…and even share their future animals with other people in need. It’s a great system. So when this catalog landed on my desk again this year, I laughed remembering the Ruby story, and then something nudged me. That maybe it was time for me to get over myself and my moral high horse and support this organization. I paged through the catalog and looked at all the pictures of the animals and the children, and I thought how engaging it might be for the kids at Hanscom Park to help give animals to kids all over the world. So I talked to the children’s education leaders and the youth leaders and finance leaders, and everyone agreed that this would be an excellent project for Christmas. Instead of doing the same thing every year, the same thing day-in and day-out, we would respond to God’s nudge to do something new, something unexpected… because it was God nudging us to play a part in God’s story where all people receive abundance and joy. It only happened because I was willing to respond to God’s nudge to do something I wouldn’t have decided on my own…and then our church leaders responded…and the our children and youth responded…and now we are all being called to respond with generosity to fill the ark. It’s not just Christmas as usual. It’s not our daily grind story. God wants abundance and wholeness and joy for us – and for all of creation. Our scripture today tells us that our expectation that things will be the same day-in and day-out can keep us from experiencing the fullness of the kingdom of God. God is always present. And God is always calling us to something new. Something bigger, something more beautiful than what has come before. Certainly something more than the death-dealing life where we simply work and shop and manage our households until we die. We are part of a much larger story: one where God loved us and all of creation so much that Christ lived and died and rose so that we could know the possibility of resurrection and redemption and restoration in every moment. So this Advent, I invite you to live. Live differently now. Experience the presence of Christ it is among us right now. And live with the confidence that you will be part of God’s future where the peace and joy and love of Christ reigns – not just on Christmas but every day. 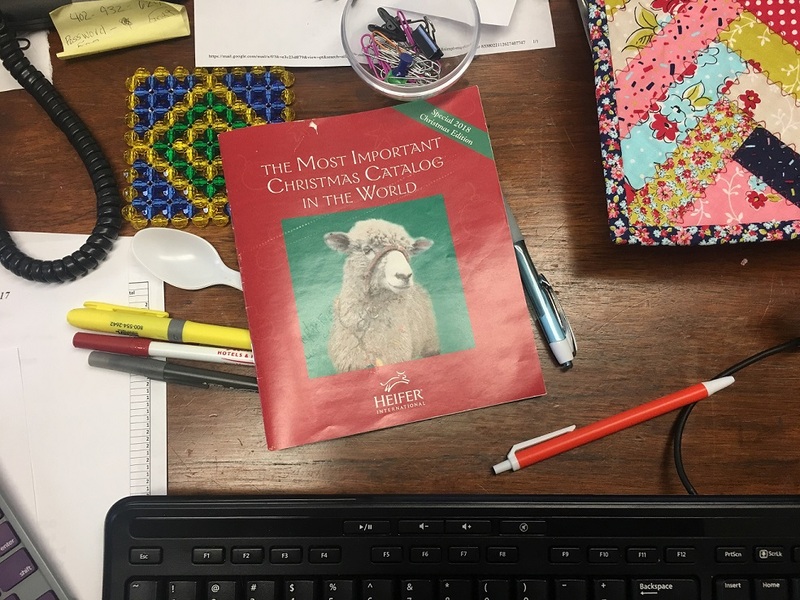 RESPOND: Is God moving you to help fill the Hanscom Park Ark through Heifer International? https://fundraise.heifer.org/team/201079 Click to donate a goose, a water buffalo, even a cow to families all over the world!